SAO PAULO (Reuters) – He has vowed to drain the swamp, slash regulations and get tough with China. Evangelicals and gun-rights advocates love him. He has denounced the media as “fake news.” Political foes? Lock ’em up. Brazil’s new president-elect, Jair Bolsonaro, is an ardent admirer — and shrewd imitator — of his U.S. counterpart Donald Trump. And that could usher in one of the warmest bilateral relationships in the Western Hemisphere. Trump called to congratulate Bolsonaro on Sunday night, shortly after the far-right congressman scored a resounding victory at the polls, winning 55 percent of the vote following a mud-slinging campaign with a leftist rival. Bolsonaro and Trump spoke of “a strong commitment to work side-by-side” on issues affecting Brazil, the United States and beyond, the White House said. Trump has bullied and wrangled with other leaders in the Americas, including Canadian Prime Minister Justin Trudeau and Mexican President Enrique Peña Nieto. But in Bolsonaro, Trump will find a doppelganger whose world view and pugnacious style are strikingly similar to his own. “Just like he wants to make America great, I want to make Brazil great,” Bolsonaro, a former army captain, said in a televised interview in July. The 63-year-old ran as an outsider bent on smashing what he sees as a corrupt and hidebound political system that has forgotten ordinary citizens. His fiery rhetoric and slurs against gays, women and minorities have thrilled followers who view him as an authentic straight shooter. He has championed law and order, patriotism and religious values. And he has demonized his leftist detractors as enemies of the people. While many world leaders have held Trump at arm’s length, Bolsonaro has made no secret of his esteem. He has praised America’s 45th president as a gutsy, decisive commander who has prevailed in the face of unfair criticism. Such blandishments are likely to play well with Trump, who has shown an affinity for authoritarian leaders, particularly those who flatter and cajole him. Christopher Garman, chief Americas analyst for the New York-based political risk consultancy Eurasia Group, said a new cross-hemisphere bromance could be in the offing. “(Bolsonaro’s) win will surely herald a stronger bilateral relationship,” Garman said. “Bolsonaro not only is a self-professed fan of Donald Trump, but both were elected on a wave of anti-establishment anger with relatively similar ideological proclivities.”The White House is likely to respond well, and Donald Trump has already shown he values personal relationships with foreign leaders,” Garman said. Bolsonaro has already signaled his plan to shift Brazilian foreign policy hard to the right, a development that would play well with the Trump administration. He has said he will move Brazil’s embassy in Israel from Tel Aviv to Jerusalem, following the lead of the United States. And similar to Trump, Bolsonaro is rethinking his country’s membership in multinational organizations and treaties that he thinks might not be in Brazil’s best interest, including the Mercosur trade bloc, the BRICS group of large emerging economies and the Paris climate accord. 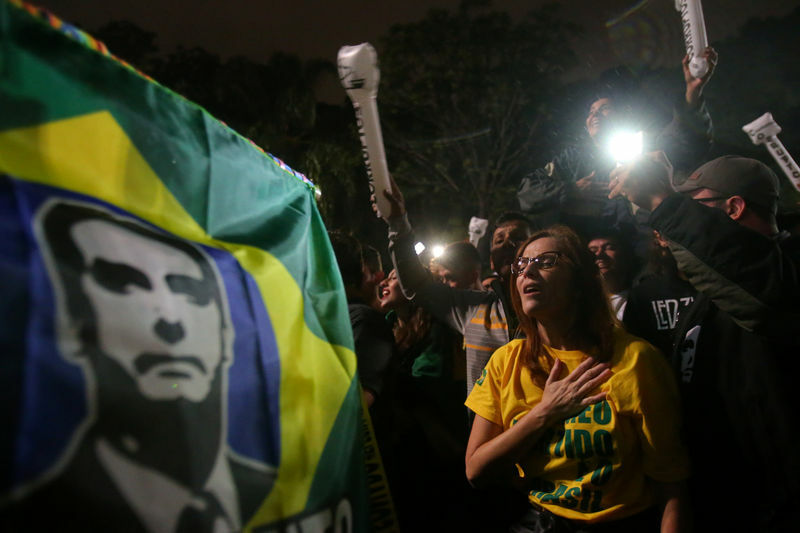 Those changes would reverse 13 years’ worth of diplomacy crafted by governments led by the country’s leftist Workers Party, which focused on alliances with Brazil’s South American neighbors and other developing powers. Bolsonaro is also questioning Brazil’s relationship with China, which he views as a predatory economic partner. The Asian giant is Brazil’s biggest foreign buyer of soybeans, iron ore and other commodities. But Bolsonaro is alarmed at a spate of Chinese purchases of Brazilian energy and infrastructure companies. “The Chinese are not buying in Brazil. They are buying Brazil,” Bolsonaro has warned repeatedly. Such talk is likely to please Trump, whose tariffs on Chinese goods have ignited a trade war that has much of the world blaming the United States for disrupting global supply chains and rattling markets worldwide. So, too, is Bolsonaro’s plan to privatize a string of Brazil’s state-owned companies and loosen environmental restrictions to make way for more mining, ranching and farming. Still, trade is likely to remain a sore point between the United States and Brazil, whose steep tariffs on imported goods make it one of the most closed economies in the world. Trump singled out Brazil this month in a rant about tariffs. Even if trade issues remain thorny, Bolsonaro’s gaze is directed north. He is an avid supporter of the National Rifle Association and vows that once he takes office on January 1, he will roll back Brazil’s strict gun laws and let citizens take up arms to defend themselves from criminals. Like Trump, Bolsonaro masterfully tapped into voters’ fears and frustrations to rocket to the presidency. Brazil is beset by appalling levels of street crime. In the past few years, a sprawling corruption investigation has revealed epic levels of corruption at the highest levels of government. One former president is in jail and another was impeached and tossed from office. The economy was hit by the worst downturn in decades and has yet to regain its luster; more than 13 million Brazilians are unemployed. Hungry for change, voters responded to Bolsonaro’s bold promises to crack heads and clean up the mess. Former Trump adviser Steve Bannon said he sees echoes of his old boss, who rode a similar wave of discontent.